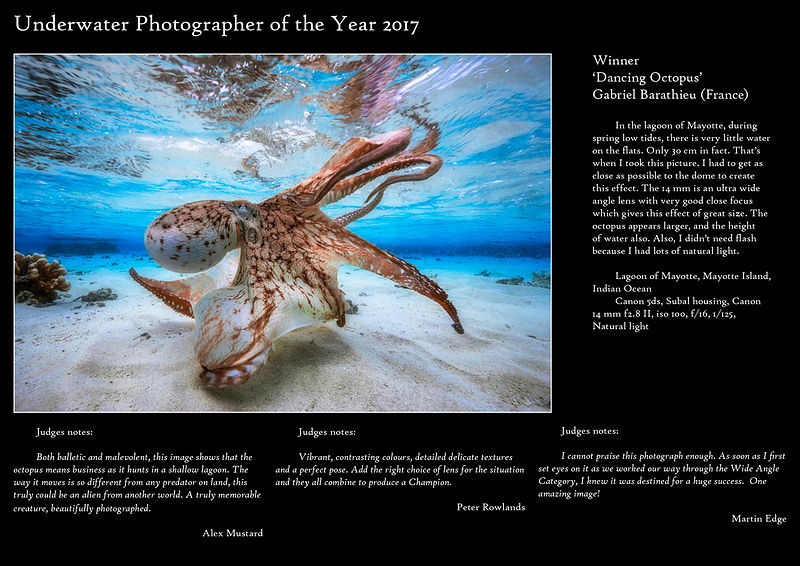 I have the immense honor and pleasure to win the title of Underwater Photographer of the year 2017 thanks to this photo of octopus taken in the lagoon of Mayotte in May 2016. UPY, Underwater Photographer of the Year is a recent competition. It is only the 3rd edition. But it is nonetheless very popular to the point of becoming in just two years an underwater photography competition impossible to circumvent. This year, nearly 4500 photos were submitted by 67 different nationalities. It is a huge and beautiful surprise for me. The level is extremely high. Just having an award-winning photo is a feat. International press coverage is part of what makes the Underwater Photographer of the Year such an impressive event, your images will we seen by a world wide audience. Chairman’s Report First of all let me reassure you that I have not organised a coup among the judges and ousted Alex from the Chair but rather recognised that, with the birth of his daughter, Isabella, in June last year, his organisational time would be limited for a while and he should be allowed more time to savour this new chapter in his life. Now to 2017 and what can I say? With over 4,500 images, we are 35% up and with entrants from 67 countries, that is a 25% increase. The most pleasing increase, for me, came from the number of entries in the Compact category and especially the British Compact category. Both of these are aimed at encouraging those users to feel included and given their space away from SLR users. Take a detailed look at the winners in both of these categories and you will see that their results are equally as impressive as the others. But these are just statistics. What is not possible to quantify statistically is the standard of entries this year and these have definitely gone up another gear. You have surpassed last years extremely high standards and taken UPY 2017 to a new level of excellence which I hope you will appreciate in this 2017 Yearbook. From my own point of view, I have been captivated not only by the winning images but also by the stories behind how those images were achieved. The conception, the planning and the physical effort to achieve a successful result; it is those efforts that we, as judges, pay our respects to by taking out two days to meet up, sit together and look in detail at all the images. It is a mammoth task but one that we all agree is a privilege to be part of. Just as UPY has expanded so too has the organising team. This year we have embraced Dan Bolt’ s IT skills to rebuild our online entry system to make it more efficient and his work in the ‘ background’ is much appreciated. Secondly Saeed Rashid accepted our invitation to join us to pump up the sponsors prize list and he has done great work in getting major sponsors from both inside and outside of our world. Both Dan and Saeed really fit in to “The UPY Philosophy” which Alex started and which Martin and I are card carrying founder members and that is we are organising this Competition for you to showcase your work and show it to a far wider world. This year, once the results have been revealed, I have volunteered to be in charge of ‘ Press liason’ which last year involved being contacted by over 100 major press outlets who wanted to feature and promote your work. The level of cover this generates cannot be underestimated but, save it to say, it sets up UPY as an important promoter of our specialised world into another much, much wider world. The possibilites this can create are almost unique. For the first time, this issue of the Yearbook includes ‘ Judges notes’ on each and every one of the 100 winning images; personal feedback to the entrant about why their image was placed; suggestions how they could have been higher placed and feedback on how much we admired their shots. This is what sets UPY apart because we want to interact with you to create a more constructive atmosphere rather than the ‘ win at all costs’ attitude which competitions in general, land and underwater, tend to encourage. Finally, this and every issue of the Yearbook provides you with the perfect reference work to study what works and is successful in our competition so that you can go out over the next year to embrace your underwater photography and come up with more groundbreaking images that will inspire us, the judges, and you, the entrants, in 2018.I’ m looking forward to next year already. Over the years I’ ve become the ‘ Go to Judge’ for those of you who seek feedback and solace with your image entries. This year is no different and I’ ll do everything I can to help you so here goes! Peter, Alex and myself judge UPY in a particular style. We judge your entries over a period of two days, not weeks With so many quality images to look at in a comparatively limited period, time is of the essence for both the judges and your images. The judges must make fast decisions about which images go through and the images must impress instantly to get through to the finalists. So I hope you will understand that it’ s essential that your image entries have immediate appeal aka ’ The Wow Factor’ . When one or more of us calls out ‘ keep’ the image is then flagged and put to one side. UPY is not a competition where we sit at our leisure and savour the best, that comes later on in the process. Your entries have to be immediately eye catching. They have to have the ‘ Wow Factor’ In the 1st round of judging, throughout all the categories there were too many cluttered backgrounds. You have to pay attention to the backgrounds of your image and in particular, what is behind your main subject and try to avoid elements which merge into each other. We don’ t go looking for compositional flaws, they stand out like a sore thumb. In all art work, distractions close to the edge of the frame attract the viewer and so often lead the eye out of the frame. We move onto the next images and seldom look back. Eyes have to be in focus. If one eye is visible, it has to be in focus. Two eyes visible, then both have to be in focus. if you have a great shot but in your heart you know that one eye is a tad soft then put it to one side, it’ s not going to progress any further. Aspect Ratio! You are allowed to crop your images however you like but before you enter, think about the aspect ratio to adopt. I was of the opinion that some entrants were leaving too much empty space around the subject. Remember that you do not have to be a slave to these ratio’ s. Other successful images were cropped into a variety of shapes which accentuated the strength of the composition. Remember, it’ s all about the image so my advice is to use the best crop for your best composition Last but not least, read the rules and guidelines carefully so that you are in adherence with the competition and most important that you enter your work in the appropriate category. 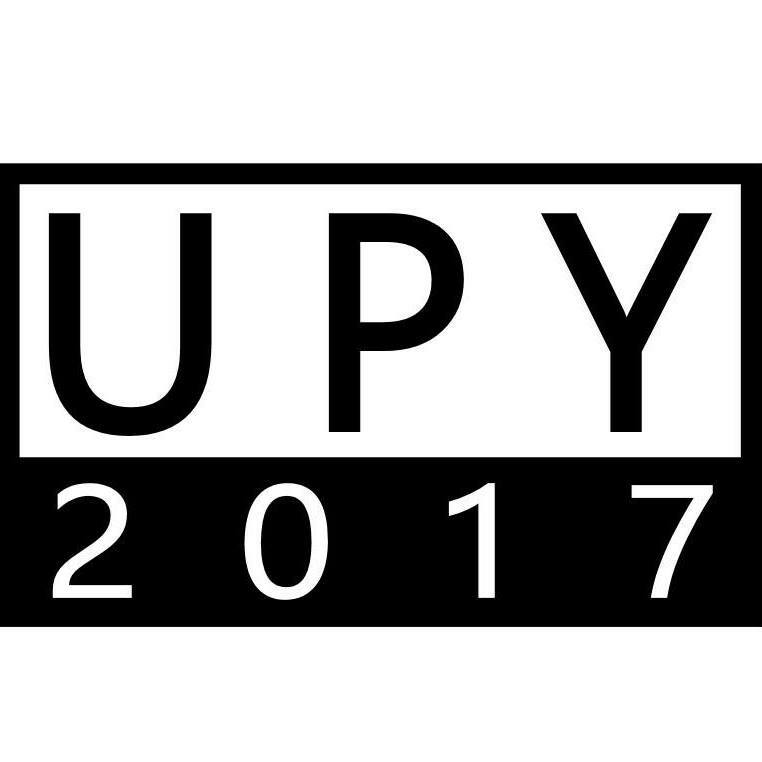 I wish you luck for UPY 2018. A big competition, like UPY, is like a crystal ball, allowing us to gaze into the future and identify the forthcoming trends in subjects, destinations and most of all techniques. As judges we get the panoramic view. This year we sat down and enjoyed over 4500 underwater photographs, the very best shots from photographers from at least 67 countries. This is more than a snapshot, it is close to a compendium from the frontiers of photography. Our role, of course, is to refine these thousands down to the 100 pictures you’ ll find here. And it is this curated collection of the very best that will go forward to influence our community. Judging brings a lot of pressure, both to find the truly outstanding images and to avoid awarding the wrong types. Since the rebirth of UPY we’ ve been keen to not encourage subject manipulation in macro photography and it was really heartening to see a very substantial drop in these types of images in the entry. A good recipe for winning is to show us something brilliant and new. While we’ ll continue to award excellence in classic images, competitions should always celebrate the pushing back of boundaries in our discipline. But we’ re not looking for who has the best box of tricks, the wining shots use techniques that are appropriate for the photo. A quote I regularly use when teaching comes from creative nature photographer Sandra Bartocha “a technique should not be used just for the sake of being different, it should suit the subject and idea”. When you see thousands of entries the new fads are obvious. A worrying trend in the macro entries was the large increase in use of artificial backgrounds. This is a complex issue because it was clear that many entrants were using these in aresponsible way and we were happy to award the best of them. But more than a handful of others were so keen to get their artificial backgrounds into shot that they didn’ t care what they had to push it into, or that their subject had to be coerced into position in front of it. For example, one photographer had even broken open a coral to shove the background into place. This places the judges in a difficult position. It is unfair to penalise those who have used artificial backgrounds with clear sensitivity to the subject and environment. But by awarding these shots we don’ t want to encourage the mass-adoption of a potentially damaging technique to win, because it is clear that many are not using backgrounds with care. My hope is that the situation will self govern. Now that pictures have been awarded they will not be regarded as novel and they will stop winning and fewer will attempt to emulate them. A similar fashion appeared in flower photography about 5 years ago, where photographers would place reflective, water filled trays behind subject to create backdrops. They were popular for a while and then photographers began to question their use, the impact of squashing life around the subject and the message that the natural world was not attractive enough alone. Soon photographers gave up on this short-cut and returned to creating beautiful backgrounds from natural surroundings.